What this case study reveals is that, with the right leadership, it is possible to turn a company around and make it far more responsive and relevant to its customers, and as a result deliver growth and profits. 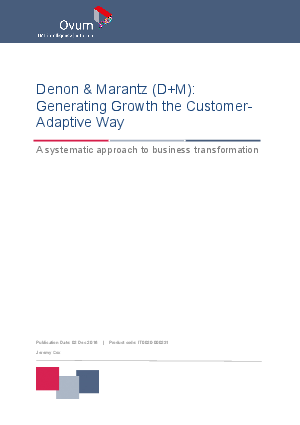 The upshot of D+M's cultural and business transformation has been a return to growth and profitability. The entire enterprise has played its part, which is why the annual Chairman's Award has recognized individuals who have lived the winning cultural values and achieved excellence in performance. Winners have included factory workers and services people. The firm also continues to innovate with HEOS WMS capabilities extending to the other brands. Customer experience continues to be an area of deep cross-functional focus, and feedback from customers provides a clear indication that the customer experience throughout their buying and ownership journeys is rated highly.